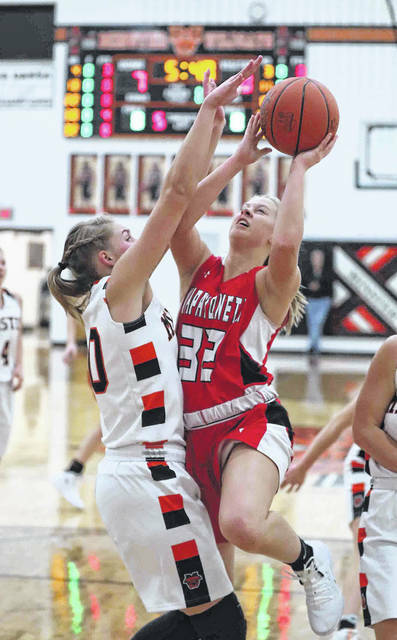 Wapakoneta’s Katie Engel puts up a shot against Minster’s Courtney Ernst, left, and Danielle Barhorst during Tuesday night’s game at Minster. The host Wildcats won the game 54-31. No other game information was reported by deadline. 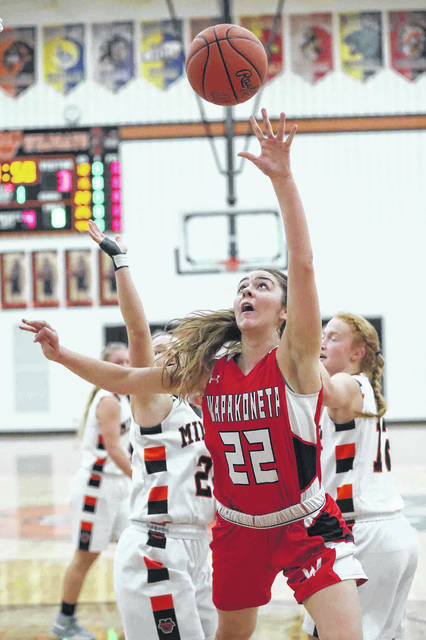 Wapakoneta’s Jessica Davis puts up a shot against Minster’s Courtney Prenger during Tuesday night’s game at Minster. MCGUFFEY — Lucas Metcalfe connected on five 3-pointers, finishing with 27 points as Delphos St. John’s defeated Upper Scioto Valley 60-51 Tuesday night in boys basketball. Jared Wurst added 12 points for DSJ. Quinn Sanders had 26 points for USV. CONTINENTAL — The visiting Bulldogs bounced back for a 26-15 halftime lead after trailing 10-8 at the end of the first quarter. Rylee Sybert (16), Kenzie King (11) and Amy Vorst (10) each scored in double digits for Grove. Catelyn Etter scored 10 for Continental. Natalie Ooenig (22), Abi Lammers (13) and Kylie Berner (10) each scored in double digits for Miller City. Zoe Chisholm had 18 points and Ayanna Vekanyasz scored nine for C-R. The Cavaliers withstood being outscored 8-3 in the final quarter. Lauren Gilliland had 13 points and Kate Leichty scored 10 for Coldwater. Lauren Langhals had 14 points and McKayla Maag scored nine for Kalida. Aly Lindeman had 16 points, Addy Stewart (12) and Delaney Deuel (11) also each scored in double digits and Karly Mawhorr had six points and seven rebounds for Jefferson. Shawnee’s Damion Music (160 pounds) and Joey Hale (220) and Spencerville’s Jay Goetz (138) and Darius Clark (285) each recorded pins. MINNEAPOLIS — Kyle Weisenburger of Ottawa will be among 170 professional anglers competing in the Fishing League Worldwide (FLW), the world’s largest tournament-fishing organization. The field will be showcased along the 2019 FLW Tour, which features seven regular-season tournaments around the country with competition kicking off at Sam Rayburn Reservoir, Jan. 10-13, in Brookeland, Texas, and culminating with the world championship of bass fishing — the FLW Cup at Lake Hamilton, Aug. 9-11, in Hot Springs, Arkansas. 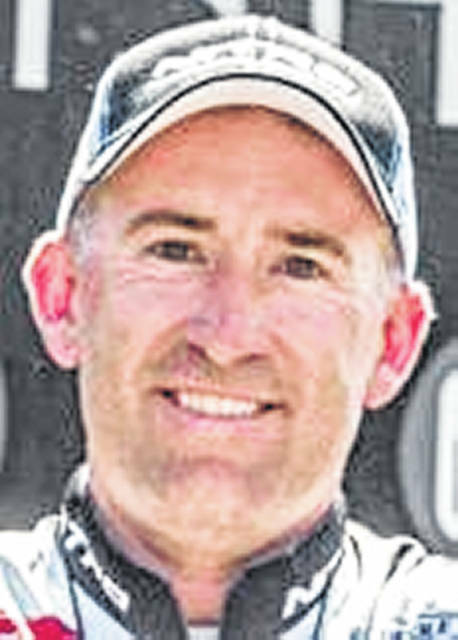 Weisenburger will be competing in his third season as a professional on the tour with more than $118,000 in career earnings with FLW and will look to qualify for his first FLW Cup. University of Northwestern Ohio forward Jackie Gardner, a Kalida graduate, and midfielder Iris Rabot have been named NAIA honorable mention All-Americans. Gardner, the Wolverine-Hoosier Athletic Conference Offensive Player of the Year and a first team All-WHAC honoree, finished second in the conference with 15 goals, third with 38 points and was tied for third in assists with eight. Rabot was the WHAC Newcomer of the Year and joined Gardner on the first team. Three University of Northwestern Ohio players hae received NAIA All-American honors. Midfielder Felipe Lupion was chosen to the third team while midfielder Luka Pekovic and defender Mikhail Radchenko were each named honorable mention. Pekovic was chosen as the WHAC Defensive Player of the Year with all three being named first all-WHAC. Middle hitter Devon Heitkamp (New Bremen) of the University of Northwestern Ohio was selected as a honorable mention All-American. The Wolverine-Hoosier Athletic Conference Newcomer of the Year in 2018, Heitkamp was also chosen first team all-WHAC. The NAIA Attacker of the Week on Oct. 16, Heitkamp finished sixth nationally with 539 kills and was 14th in kills per set at 4.05. Along with leading the conference in kills and kills per set, she was sixth with a .273 hitting percentage. BLUFFTON — Isaac Zickafoose has been named second team All-North Region by D3football.com following a senior season that saw the defensive end earn his second Heartland Collegiate Athletic Conference Defensive Player of the Year award. It marks the third straight year that Zickafoose has been an All-Region selection after back-to-back third team honors. Zickafoose led the HCAC with 11.5 sacks (third all-time at Bluffton) and his 17.0 TFL’s were second in the HCAC and fifth all-time for a season at Bluffton. His 80 fumble recovery yards topped the HCAC and set a new school mark, while his eight breakups were tied for sixth in the HCAC and fifth all-time at Bluffton. He was second on the team with 63 tackles and his 49 solo stops led the Beavers.